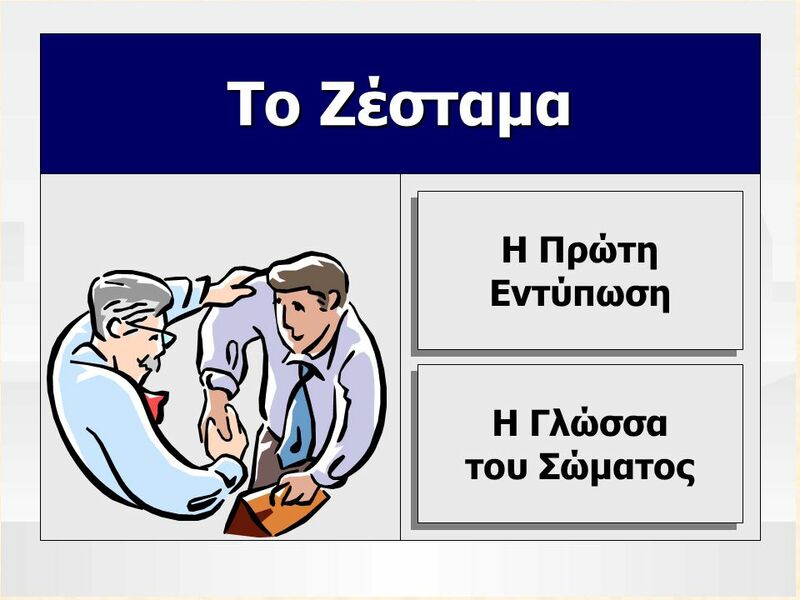 Μεταπαρακολούθηση Your résumé (see Chapter 14) is the centerpiece of your job search package, but it needs support from several other employment messages, including application letters, job-inquiry letters, application forms, and follow-up notes. 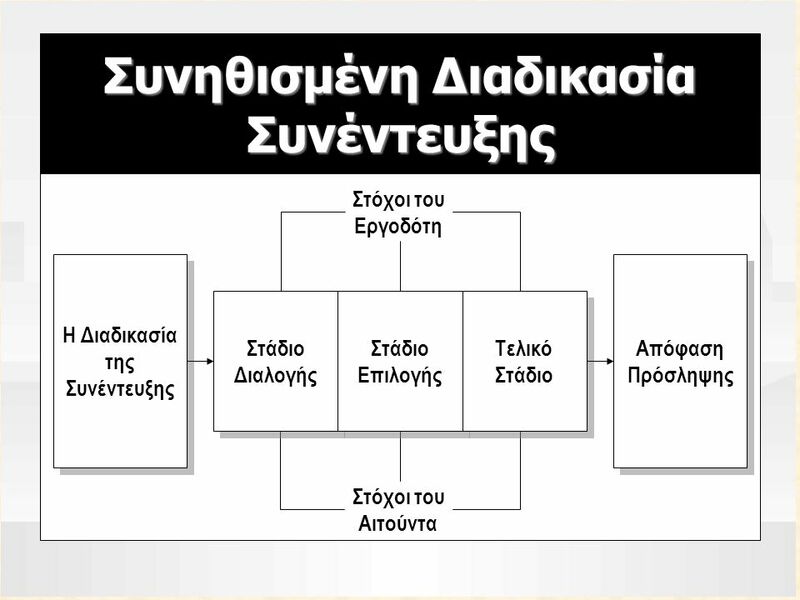 Επιστολές Διερεύνησης Εργασίας Δείξτε Ενδιαφέρον Δείξτε Πρωτοβουλία Εξασφαλίστε την Αίτηση Μεταπαρακολούθηση Αιτήσεων Δείξτε Ενδιαφέρον Δείξτε Επιμονή Ενημερώστε την Αίτηση Before considering you for a position, some organizations require you to fill out and submit an application form, a standardized data sheet that simplifies the comparison of applicants' qualifications. To request such a form, send a job-inquiry letter and include enough information about yourself in the letter to show that you have at least some of the requirements for the position you are seeking. Instead of writing a letter of this kind, you may want to drop in at the office you’re applying to. You probably won’t be able to talk to anyone other than the receptionist or a human resources assistant, but you can pick up the form, get an impression of the organization, and demonstrate your initiative and energy. If your application letter and résumé fail to bring a response within a month or so, follow up with a second letter to keep your file active. This follow-up letter also gives you a chance to update your original application with any recent job-related information. Without a follow-up communication from you, the human resources office is likely to assume that you’ve already found a job and are no longer interested in the organization. Moreover, a company’s requirements change. A follow-up letter can demonstrate that you’re sincerely interested in working for the organization, that you’re persistent in pursuing your goals. committed to upgrading your skills And it might just get you an interview. 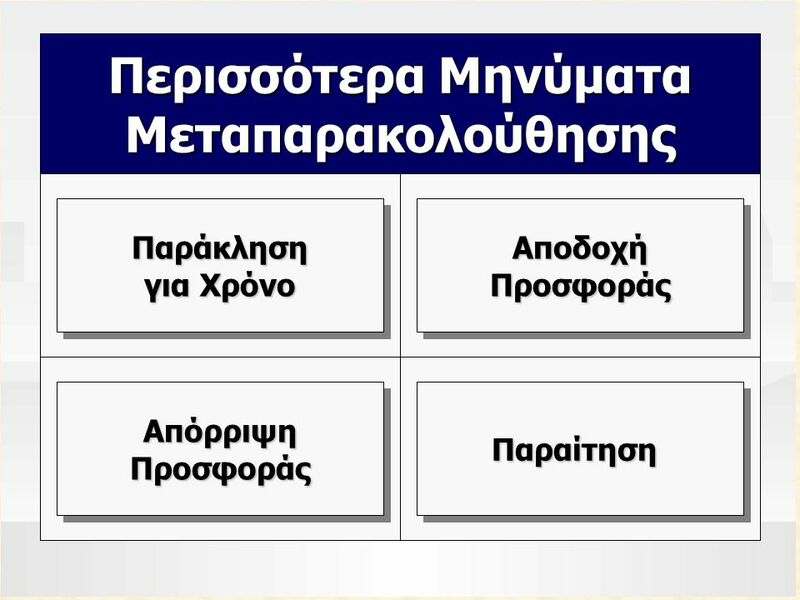 Κύριος Στόχος της Εταιρίας Κύριος Στόχος του Αιτούντα Να Ταιριάζουν οι Αιτούντες με την Εταιρία Να Ταιριάζουν οι Στόχοι και οι Ικανότητες με την Εργασία An employment interview is a formal meeting during which both employer and applicant ask questions and exchange information. These meetings have a dual purpose: (1) the organization's main objective is to find the best person available for the job by determining whether the applicant and the organization are a good match, and (2) the applicant's main objective is to find the job best suited to his or her goals and capabilities. 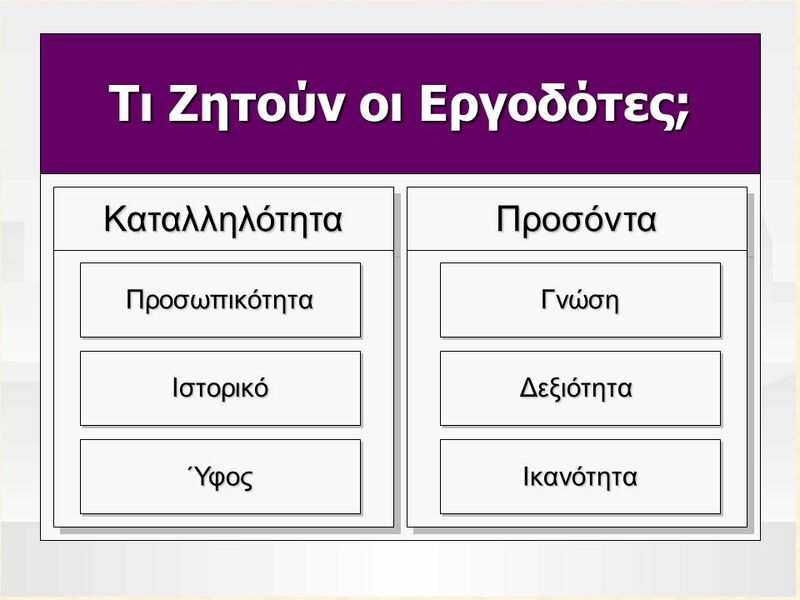 Δοκιμασίες για Ουσίες Προφίλ Προσωπικότητας Έλεγχος Ιστορικού Δοκιμασίες Ακεραιότητας Εργασιακές Ικανότητες Many companies rely on pre-employment testing to determine whether applicants are suited to the job and whether they’ll be worth the expense of hiring and training. Companies use three main procedures: job-skills testing, psychological testing, and drug testing. 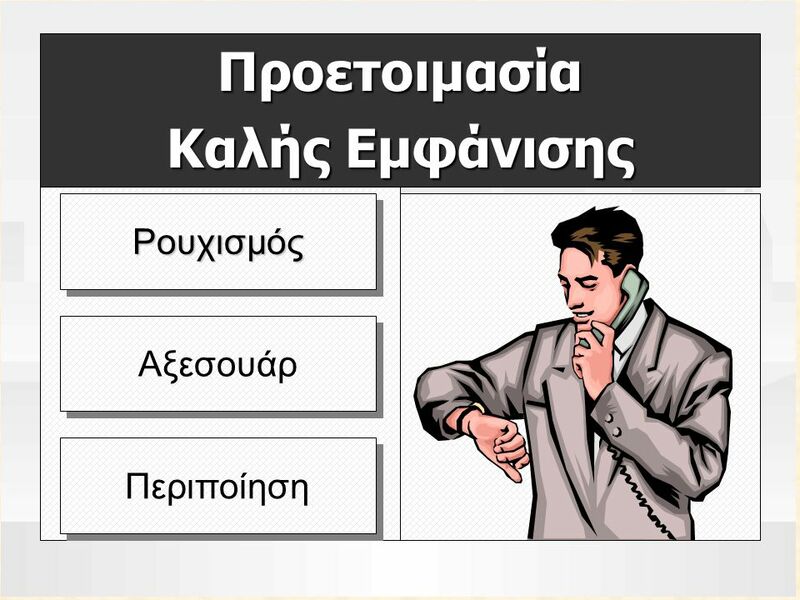 Job-skills tests. These are common, and designed to assess competency or specific abilities needed to perform a job. Integrity tests. You might not think that a test could identify job candidates who are more likely to steal from their employers or commit other ethical or legal infractions, but employers have had some success in using integrity tests. Substance tests. To avoid the increased costs and reduced productivity associated with drug abuse in the workplace (estimated to cost industry some $100 billion a year), many employers require applicants to be tested for drug use. Companies with mandatory testing have found real advantages, including lower accident rates, fewer disability claims, and decreased violence and absenteeism. Nevertheless, some employers prefer not to incur the extra expense to administer drug tests; others consider such tests an invasion of privacy. Personality Profiles. Personality tests can try to assess either general character or suitability for the demands of specific profession. General tests attempt to profile overall intellectual ability, attitudes toward work, interests, and managerial potential as well as such characteristics as dependability, commitment, honesty, and motivation. Background checks. Although not a test in the usual sense, a background check also helps employers learn more about you. A background check might be used to verify the credentials on your résumé, to see how well you manage credit, or even if to learn if you have a criminal history. These investigations can generate considerable controversy, since some people consider them an invasion of privacy. However, many employers believe they have no choice, given the magnitude of the risks they now face. Employers can be held liable for the actions of employees who obtained jobs under false pretenses—and lying on résumés and in interviews has reached epidemic proportions. 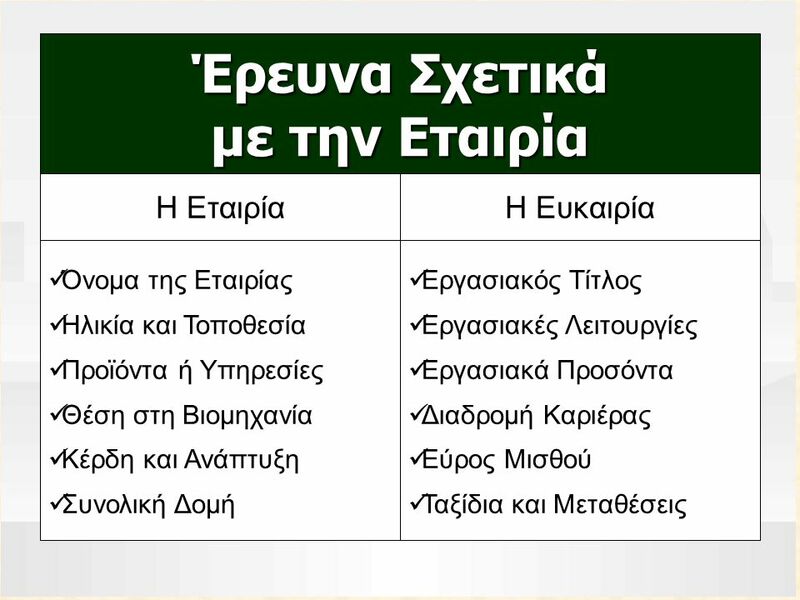 Έρευνα σχετικά με την εταιρία Σχέδιο για ερωτήσεις Ενίσχυση της αυτοπεποίθησής σας Γυάλισμα του ύφους σας Προετοιμασία καλής εμφάνισης Ετοιμότητα κατά την άφιξη Preparation will help you perform better under pressure; moreover, the more prepared you are, the less nervous you'll be about the interviewing process. Be sure to consider any cultural differences when preparing for interviews, and base your approach on what your audience expects. To prepare for a successful interview, learn about the organization, think ahead about questions, bolster your confidence, polish your interview style, plan to look good, and be ready when you arrive. 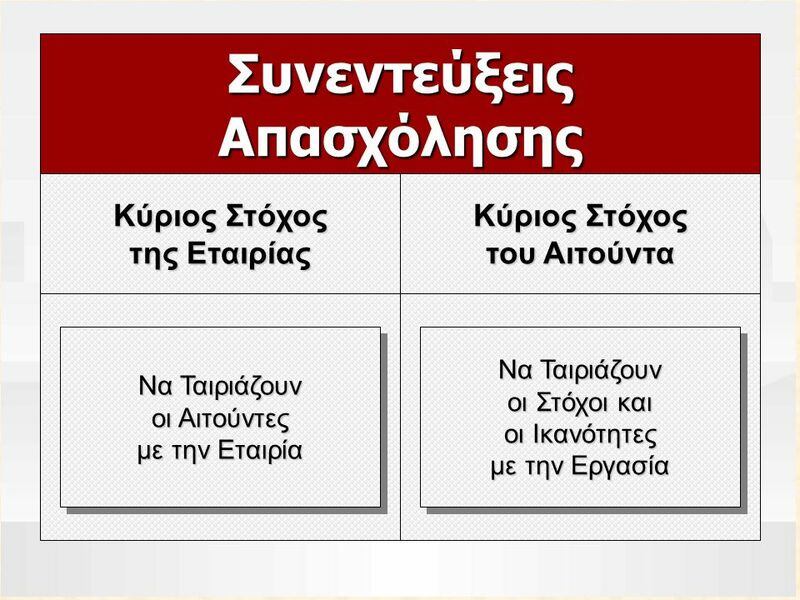 Η Εταιρία Η Ευκαιρία Όνομα της Εταιρίας Ηλικία και Τοποθεσία Προϊόντα ή Υπηρεσίες Θέση στη Βιομηχανία Κέρδη και Ανάπτυξη Συνολική Δομή Εργασιακός Τίτλος Εργασιακές Λειτουργίες Εργασιακά Προσόντα Διαδρομή Καριέρας Εύρος Μισθού Ταξίδια και Μεταθέσεις When planning your employment search, you probably already researched the companies you sent your résumé to. But now that you've been invited for an interview, you'll want to fine-tune your research and brush up on the facts you've collected. Today’s companies expect serious candidates to demonstrate an understanding of the company’s operations, its market, and its strategic and tactical problems. Learning about the organization and the job enables you to show the interviewer just how you will meet the organization's particular needs. 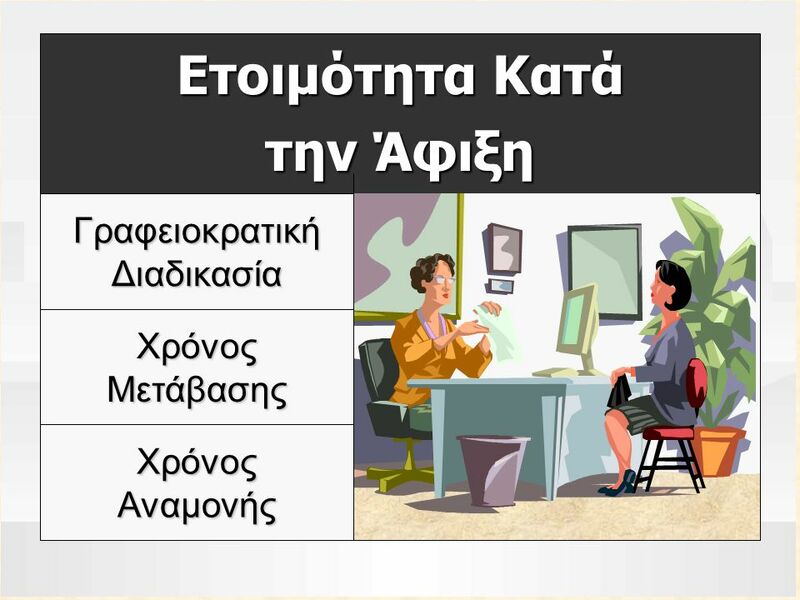 Συμπεριφορά Σχέσεις Planning ahead for the interviewer’s questions will help you handle them more confidently and intelligently. Moreover, you will want to prepare insightful questions of your own. Employers usually gear their interview questions to specific organizational needs. You can expect to be asked about your skills, achievements, and goals, as well as about your attitude toward work and school, your relationships with others (work supervisors, colleagues, and fellow students), and occasionally your hobbies and interests. 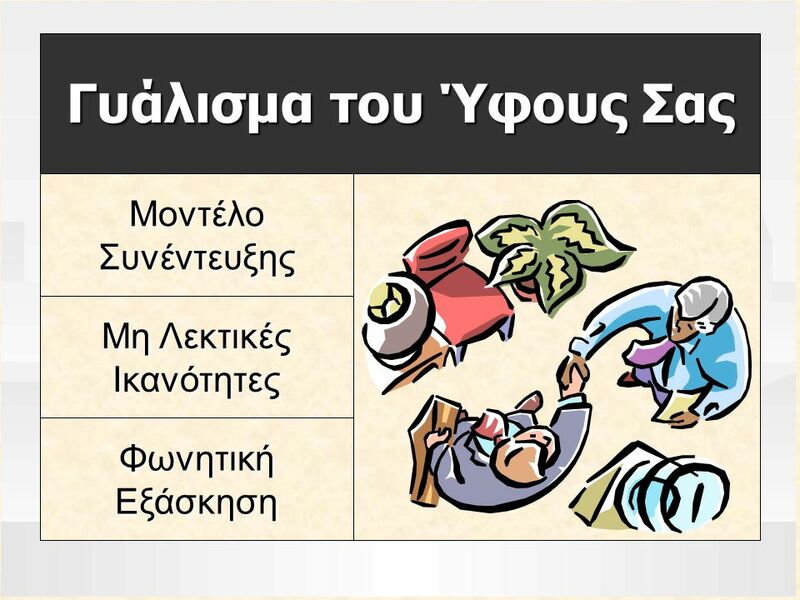 Μου ταιριάζουν αυτοί οι άνθρωποι; Μπορώ να κάνω αυτή την εργασία; Θα απολαμβάνω αυτή την εργασία; Θέλω αυτή την εργασία; Πληρώνει καλά αυτή η εργασία; Ποιος θα είναι προϊστάμενός μου; Τι είδους μέλλον μπορώ να αναμένω; Before the interview, prepare a list of about a dozen questions you need answered in order to evaluate the organization and the job. Don't limit your questions to those you think will impress the interviewer, or you won't get the information you’ll need to make a wise decision if and when you're offered the job. Here’s a list of some things you might want to find out: Are these my kind of people? Can I do this work? Will I enjoy the work? Is the job what I want? Does the job pay what I'm worth? What kind of person would I be working for? What sort of future can I expect with this organization? Rather than bombarding the interviewer with these questions the minute you walk in the room, use a mix of formats to elicit this information. Take your list of questions to the interview on a notepad. If you need to, jot down brief notes during the meeting, and be sure to record answers in more detail afterward. Having a list of questions should impress the interviewer with your organization and thoroughness. It will also show that you're there to evaluate the organization and the job as well as to sell yourself. 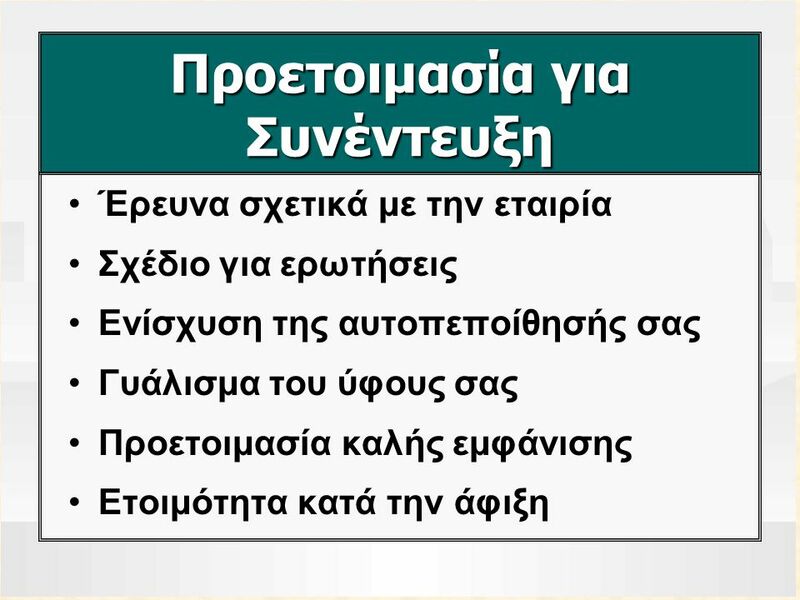 Ελαχιστοποίηση Αδυναμιών Μεγιστοποίηση Δυνατών Σημείων Διαχείριση Συναισθημάτων By building your confidence, you'll make a better impression. The best way to counteract any apprehension is to remove its source. You may feel shy or self-conscious because you think you have some flaw that will prompt others to reject you. Bear in mind, however, that you're much more conscious of your limitations than other people are. If some aspect of your appearance or background makes you uneasy, correct or offset it by emphasizing positive traits such as warmth, wit, intelligence, or charm. Instead of dwelling on your weaknesses, focus on your strengths. Rather than worrying about your performance during the interview, focus on how you can help the organization succeed. Remember that other candidates are just as nervous as you are; moreover, the interviewer is probably nervous too, since he or she will be judged on the quality of candidates that are hired. 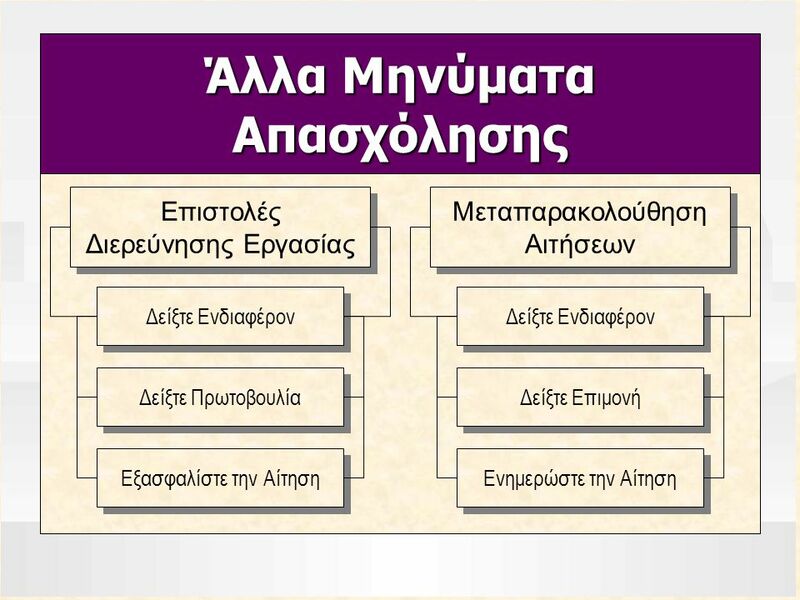 Γυάλισμα του Ύφους Σας Μοντέλο Συνέντευξης Μη Λεκτικές Ικανότητες Φωνητική Εξάσκηση Confidence helps you walk into an interview, but once you're there, you want to give the interviewer an impression of poise, good manners, and good judgment. Some job seekers hire professional coaches and image consultants to create just the right impression. You can develop an adept style by staging mock interviews with a friend. 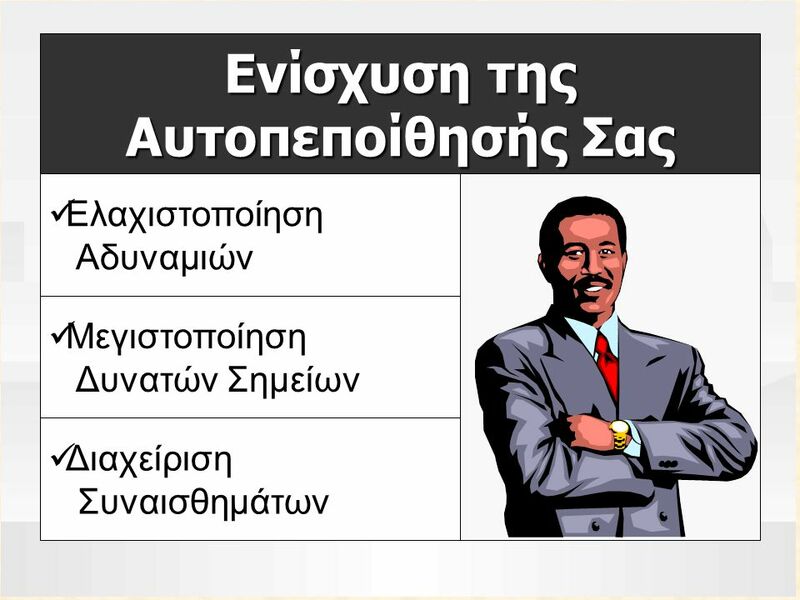 Ρουχισμός Αξεσουάρ Περιποίηση Physical appearance is important because clothing and grooming reveal something about a candidate's personality and professionalism. When it comes to clothing, the best policy is to dress conservatively. Wear the best-quality businesslike clothing that you can. However, wearing clothes that are appropriate and clean is far more important than wearing clothes that are expensive. Good grooming makes any style of clothing look better. 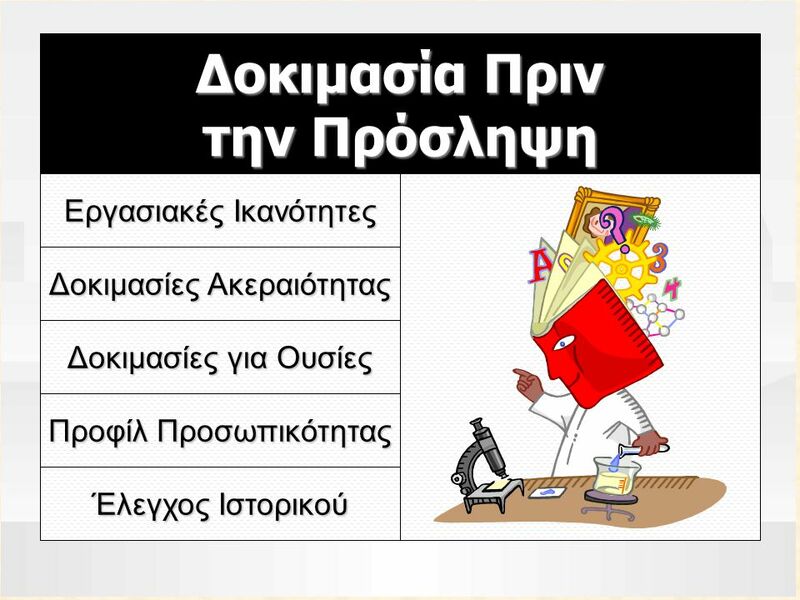 Γραφειοκρατική Διαδικασία Χρόνος Μετάβασης Χρόνος Αναμονής Plan to take a small notebook, a pen, a list of the questions you want to ask, two copies of your résumé (protected in a folder), an outline of what you have learned about the organization, and any past correspondence about the position. You may also want to take a small calendar, a transcript of your college grades, a list of references, and a portfolio containing samples of your work, performance reviews, and certificates of achievement. In an era when many people exaggerate their qualifications, visible proof of your abilities carries a lot of weight. Be sure you know when and where the interview will be held. Find out how much time it takes to get there; then plan to arrive early. Once you arrive relax. You may have to wait, so bring something business-oriented to read. In every case, show respect for everyone you encounter because anything you say or do could get back to the interviewer. 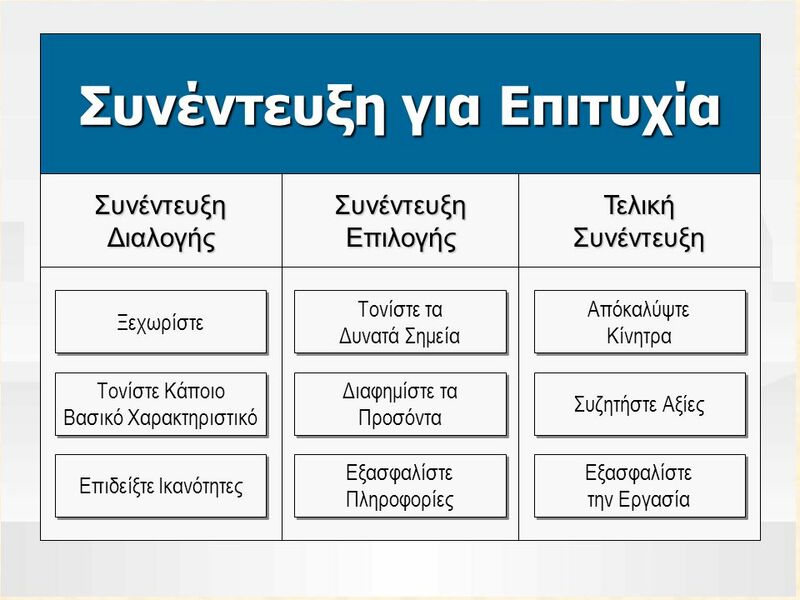 Συνέντευξη Επιλογής Τονίστε τα Δυνατά Σημεία Διαφημίστε τα Προσόντα Εξασφαλίστε Πληροφορίες Τελική Συνέντευξη Απόκαλύψτε Κίνητρα Συζητήστε Αξίες Εξασφαλίστε την Εργασία Συνέντευξη Διαλογής Ξεχωρίστε Τονίστε Κάποιο Βασικό Χαρακτηριστικό Επιδείξτε Ικανότητες How you handle a particular interview depends on where you stand in the interview process. If you're being interviewed for the first time, your main objective is to differentiate yourself from the many other candidates who are also being screened. Just be sure the trait you accentuate is relevant to the job in question. In addition, you'll want to be prepared in case an employer expects you to demonstrate a particular skill (perhaps problem solving) during the screening interview. If you progress to the initial selection interview, broaden your sales pitch. Instead of telegraphing the "headline," give the interviewer the whole story. Touch briefly on all your strengths, but explain three or four of your best qualifications in depth. 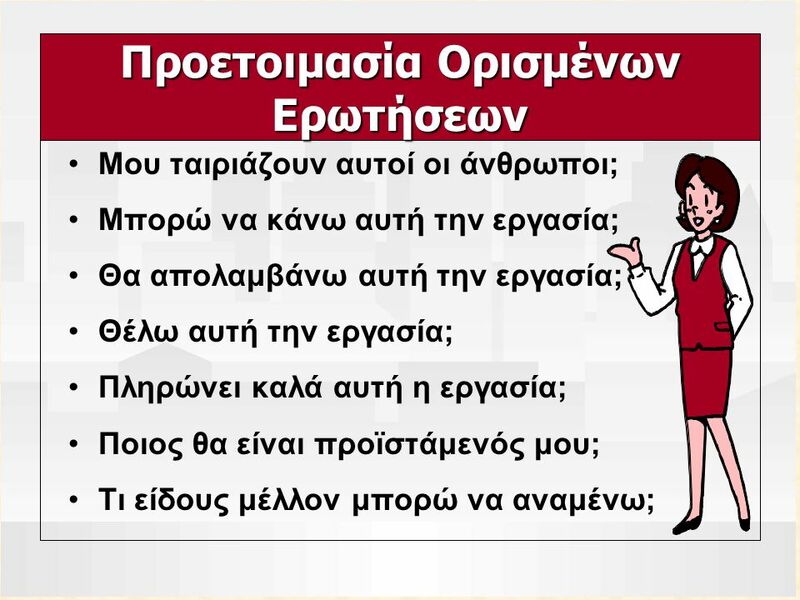 At the same time, probe for information that will help you evaluate the position objectively. As important as it is to get an offer, it's also important to learn whether the job is right for you. If you're asked back for a final visit, your chances of being offered a position are quite good. At this point, you'll talk to a person who has the authority to make an offer and negotiate terms. This individual may have already concluded that your background is right for the job and may be more concerned with sizing up your personality. Both you and the employer need to find out whether there is a good psychological fit. Be honest about your motivations and values. If the interview goes well, your objective should be to clinch the deal on the best possible terms. 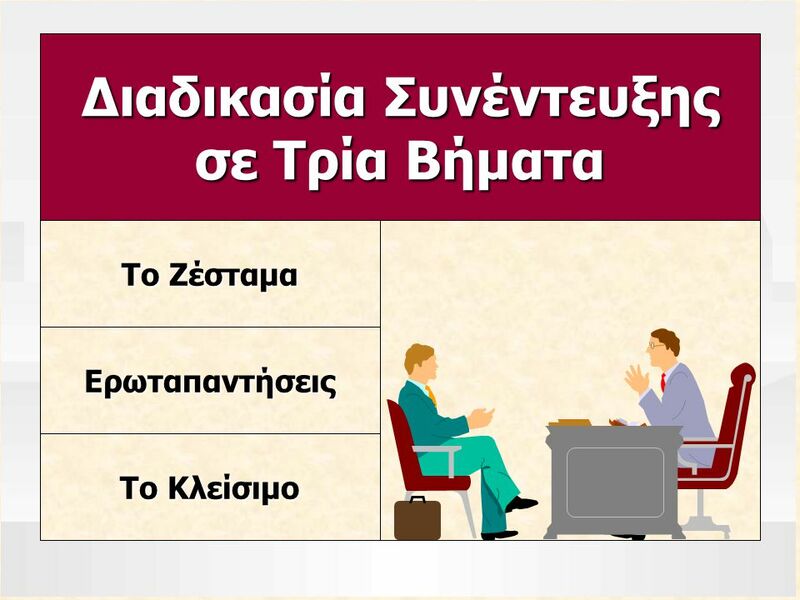 Το Ζέσταμα Ερωταπαντήσεις Το Κλείσιμο Regardless of where you are in the interview process, every interview will proceed through three stages: the warm-up, the question-and-answer session, and the close. Of the three stages, the warm-up is the most important, even though it may account for only a small fraction of the time you spend in the interview. Psychologists say that 50 percent of an interviewer's decision is made within the first 30 to 60 seconds, and another 25 percent is made within 15 minutes. If you get off to a bad start, it's extremely difficult to turn the interview around. Body language is important at this point. Because you won't have time to say much in the first minute or two, you must sell yourself nonverbally. Begin by using the interviewer's name if you're sure you can pronounce it correctly. If the interviewer extends a hand, respond with a firm but gentle handshake, and wait until you’re asked to be seated. Let the interviewer start the discussion, and listen for cues that tell you what he or she is interested in knowing about you as a potential employee. 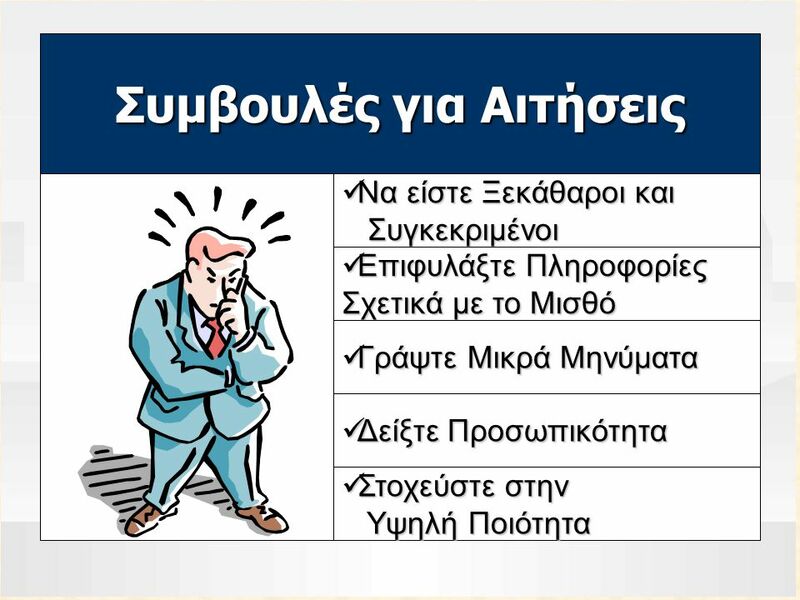 Ερωταπαντήσεις Αντιμετώπιση Ερωτήσεων Προσεκτική Ακρόαση Questions and answers will consume the greatest part of the interview. The interviewer will ask you about your qualifications and discuss many of the points mentioned in your résumé. You'll also be asking questions of your own. Let the interviewer lead the conversation, and never answer a question before he or she has finished asking it. Tailor your answers to make a favorable impression. Don't limit yourself to yes or no answers. If you're asked a difficult question, be sure you pause to think before responding. If you periodically ask a question or two from the list you've prepared, you'll not only learn something but also demonstrate your interest. Paying attention when the interviewer speaks can be as important as giving good answers or asking good questions. Listening should make up about half the time you spend in an interview. The interviewer's facial expressions, eye movements, gestures, and posture may tell you the real meaning of what is being said. Be especially aware of how your comments are received. Employers cannot legally discriminate against a job candidate on the basis of race, color, gender, age (from 40 to 70), marital status, religion, national origin, or disability. If you are asked personal questions, how you respond depends on how badly you want the job, how you feel about revealing the information asked for, what you think the interviewer will do with the information, and whether you want to work for a company that asks such questions. 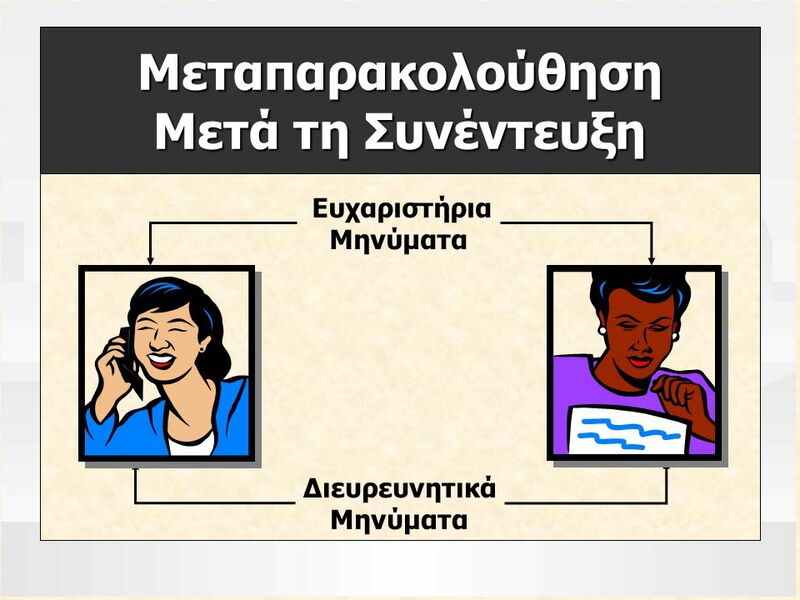 Συζήτηση Σχετικά με το Μισθό Ανασκόπηση Σημειώσεων Like the warm-up phase, the end of the interview is more important than its duration would indicate. In the last few minutes, you need to evaluate how well you've done. You also need to correct any misconceptions the interviewer might have. You can generally tell when the interviewer is trying to conclude the session. He or she may ask if you have any more questions, sum up the discussion, change position, or indicate with a gesture that the interview is over. When you get the signal, respond promptly, but don't rush. Be sure to thank the interviewer for the opportunity and express an interest in the organization. If you can do so comfortably, try to pin down what will happen next, but don't press for an immediate decision. If you do receive an offer during the interview, you'll naturally want to discuss salary. However, let the interviewer raise the subject. If asked your salary requirements, say that you would expect to receive the standard salary for the job in question. If you don't like the offer, you might try to negotiate, provided you're in a good bargaining position and the organization has the flexibility to accommodate you. If yours is a typical job search, you'll have many interviews before you accept an offer. For that reason, keeping a notebook interview notes can help you refresh your memory of each conversation. As soon as the interview ends, jot down the names and titles of the people you met. Briefly summarize the interviewer's answers to your questions. Then evaluate your performance. 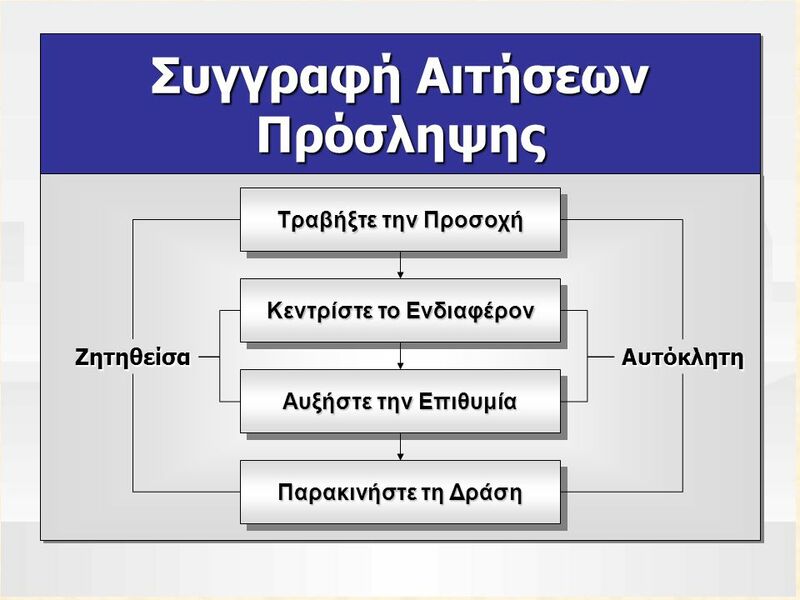 Κατέβασμα ppt "Αιτήσεις και Συνεντεύξεις για Απασχόληση"
Ανάπτυξη Πειστικών Μηνυμάτων. Διαδικασία Ανάπτυξης Θέματος σε Τρία Βήματα Βήμα 1Βήμα 3Βήμα 2 ΣχεδιασμόςΑνάπτυξη Θέματος Ολοκλήρωση.